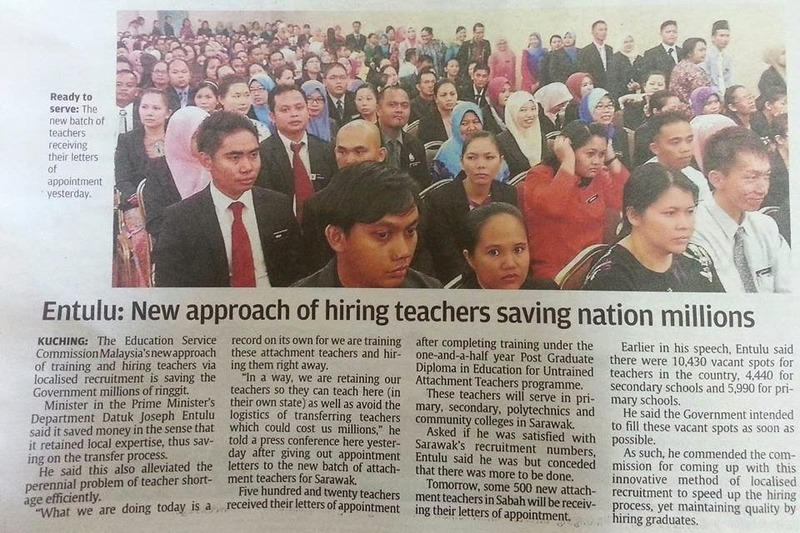 KUCHING: The Education Service Commission Malaysia’s new approach of training and hiring teachers via localised recruitment is saving the Government millions of ringgit. Minister in the Prime Minister’s Department Datuk Joseph Entulu said it saved money in the sense that it retained local expertise, thus saving on the transfer process. He said this also alleviated the perennial problem of teacher shortage efficiently. “What we are doing today is a record on its own for we are training these attachment teachers and hiring them right away. “In a way, we are retaining our teachers so they can teach here (in their own state) as well as avoid the logistics of transferring teachers which could cost us millions,” he told a press conference here yesterday after giving out appointment letters to the new batch of attachment teachers for Sarawak. Five hundred and twenty teachers received their letters of appointment after completing training under the one-and-a-half year Post Graduate Diploma in Education for Untrained Attachment Teachers programme. These teachers will serve in primary, secondary, polytechnics and community colleges in Sarawak. Asked if he was satisfied with Sarawak’s recruitment numbers, Entulu said he was but conceded that there was more to be done. Tomorrow, some 500 new attachment teachers in Sabah will be receiving their letters of appointment. Earlier in his speech, Entulu said there were 10,430 vacant spots for teachers in the country, 4,440 for secondary schools and 5,990 for primary schools. He said the Government intended to fill these vacant spots as soon as possible. As such, he commended the commission for coming up with this innovative method of localised recruitment to speed up the hiring process, yet maintaining quality by hiring graduates.